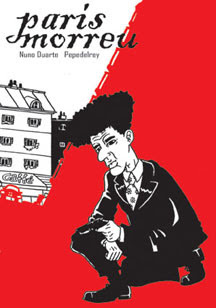 This are the 3 books we have already published: PARIS MORREU, written by Nuno Duarte and drawn by Pepedelrey. 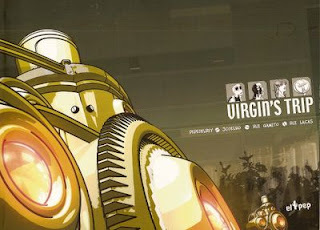 A black and white comic book about a detective in the middle of an strange and bizarre case of love and hate; VIRGIN'S TRIP, written by Pepedelrey and drawn by Pepedelrey, JCoelho, Rui Gamito and Rui Lacas and with the precious graphic designer Sérgio Duque. A cyber-bizarre-sci-fi story about two friends in love with a machine; FATO DE MACACO, written and drawn by Rui Gamito and painted by Rui Lacas. 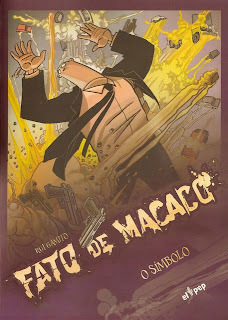 This is the second story with a strange character called Fato De Macaco.